Largely due to the efforts of retired history professor Eureka Sanford, the town of Poppyville is moving and renovating an Old West log cabin into a California Gold Rush museum. As one of the members of the women’s business group the Greenstockings, Elliana Allbright is thrilled that one of their projects is coming to fruition, although the discovery of a butter churn amongst the furnishings comes with mixed reactions. Seals indicate that the butter churn had been made into a time capsule from 1850, and Eureka jumps at opportunity to promote its opening as a tourist-attracting event. Gifted with an extraordinary sense of smell and the ability to soothe clients at her Scents & Nonsense aromatherapy store, Ellie can’t ignore the odd scent or ominous feelings she last felt just before encountering death. While everyone’s highest expectations are met when the churn is revealed to contain an actual gold nugget, Eureka and Ellie are far more interested in the historical documents inside. A picture of a woman could be Ellie’s twin, while a diary has Eureka eager to study it as a subject for her next book. Unfortunately, Ellie’s “super-powered” nose proves correct once again when her corgi Dash leads them to Eureka’s body, bludgeoned to death by a shovel inside the Heritage House cabin. Unable to resist following the botanical clues that only she could detect, Ellie and her similarly gifted friends use their talents to track down the killer of their genial historian. A magically transforming journal left by Ellie’s grandmother provides further guidance, but it will be her resilience and that of her ebullient friends that will allow them to sift through the growing suspect pool of culprits. This is a novel that vividly comes alive through the detailed, elaborate descriptions of Poppyville and Ellie’s beloved Enchanted Garden. The adorable cover only hints at the floral bounty described within the pages, but even more ingenious is the use of botanical clues that lead to the reveal of a murderer. 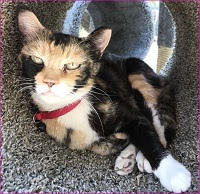 Ellie may use her senses – both olfactory and psychic – to help her solve the puzzles, but the final puzzle pieces come together through practical snooping and investigation. Ellie’s adventures are never reckless or too intrusive, making her both relatable and sensible. Just as refreshing is how a possible romantic triangle is resolved by mature communication and acknowledgment of feelings. In this third enchanting entry of the series, the author delivers the perfect combination of romance, intrigue, an adorable corgi, and magical gardening sure to delight any mystery reader. To enter to win a copy of Marigolds for Malice, simply email KRL at krlcontests@gmail[dot]com by replacing the [dot] with a period, and with the subject line "marigolds,” or comment on this article. A winner will be chosen October 13, 2018. U.S. residents only. If entering via email please include your mailing address (so if you win we can get the book sent right out to you), and if via comment please include your email address. You can read our privacy statement here if you like. Gorgeous cover and I love the botanical aspect. 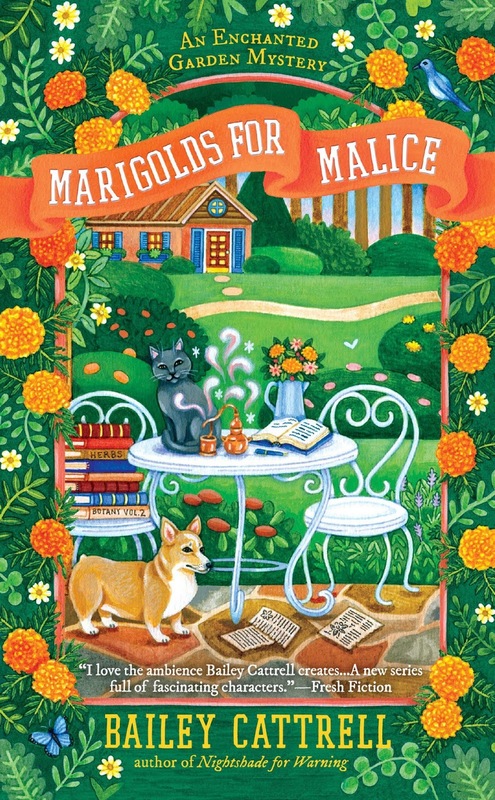 Marigolds for Malice looks to be a great read, I would love to win this! This is another new series to me. Would really like to read. I'm so glad my nose isn't super-powered as I have allergies! Sounds like a fun read.